Have you started some of your Spring cleaning and organizing projects yet? 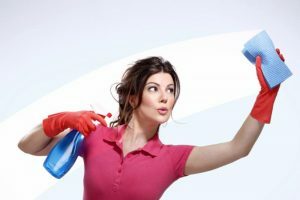 Do you ever wonder why and how Spring cleaning rituals started? Throughout history, spring has always been a time of cleaning, organizing and renewal in general. Many cultures and religions have cleaning rituals that originated generations or centuries ago. Before Passover begins, every room, closet, cupboard and refrigerator is cleaned so that all “chametz”, crumbs of leavened products, can be removed. Unleavened bread was fed to the Jews as they fled Egypt and it is served during the holiday as a symbol of their survival. So any leavened bread or even crumbs is considered un-cleanliness or ungratefulness. Thus the home is thoroughly cleaned from top to bottom. In other religious traditions, Catholics clean the church altar the day before Good Friday. Members of the Greek Orthodox Church clean their houses for a week leading up to Lent. In Iran, the holiday Nowruz or Persian New Year, arrives with the first day of spring and involves cleaning the whole house. During the 1800s a lot of heavy-duty cleaning was required due to the set-up of the home. Lamps and lights burned whale oil and kerosene while the fireplaces burned coal and wood. A layer of soot and grime enveloped every room. Being able to open windows and doors to clean out all the rooms and their contents could only begin in the warmer months of spring. Spring cleaning might have to do something with our biology and genetic make-up as well. During the winter, our pineal gland secretes more melatonin, a hormone that makes us want to sleep more. But in the spring, our melatonin subsides, and that coupled with more daylight, energize us for activities like Spring cleaning and organizing. Not long ago, many families had entire staffs to clean and organize their home. Think of Downton Abbey and how the (especially female) staff spent their entire days cleaning and organizing every room in the enormous home. Today, many busy professionals have regular housecleaning services so that they can spend more time with their families, on their hobbies or just relaxing. Smart people know that hiring professionals to help with home projects just makes sense in their busy lives. Wish that you could have a staff to help with cleaning and organizing projects? Well you certainly can get help for your spring projects. Please contact me so I can help you with your organizing projects and I can give you a trustworthy referral for your housecleaning. And let the Spring cleaning and organizing rituals begin.